Close to the city centre as well as people were visiting. It is currently undergoing renovations so the I renovated suite we had was very bare bones. The staff were very accommodating though in providing us with access to useful items. No hash browns at breakfast! The hotel was lovely but the breakfast could be a little better. Where to find Elmsdale hotels near an airport? 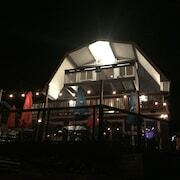 Where can I find hotels in Elmsdale that are near tourist attractions? Traveling to Halifax? Do you want to book accommodation just a short drive from the downtown area of Elmsdale? Within a 0.1-kilometre (0.06-mile) distance from central Elmsdale you'll find 3 hotel and apartment options from which to choose. 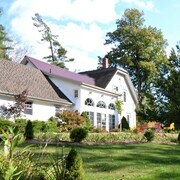 A convenient option if you want to stay near the middle of Elmsdale, is the The Briarwood Bed and Breakfast. You could also check out the Inn on the Lake, an Ascend Hotel Collection Member and also the Hampton Inn & Suites by Hilton Halifax - Dartmouth. 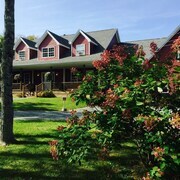 The Inn on the Lake, an Ascend Hotel Collection Member is 20 kilometres (13 miles) from the main part of Elmsdale. The Hampton Inn & Suites by Hilton Halifax - Dartmouth, is 30 kilometres (19 miles) away. Another possibility is to check out the rates and amenities at the Holiday Inn Express Halifax Airport or the Hilton Garden Inn Halifax Airport. 35 kilometres (22 miles) from Elmsdale is Dartmouth, where you'll find Fisherman's Cove and Mic Mac Mall. Should you wish to spend a few nights in Dartmouth, check out the Halifax Marriott Harbourfront Hotel and Residence Inn by Marriott Halifax Downtown. 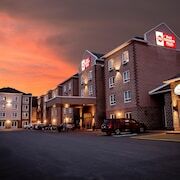 30 kilometres (19 miles) to the southwest of Elmsdale, you'll find Bedford, which is home to the Château Bedford Hotel & Suites and Holiday Inn Express & Suites Halifax - Bedford. 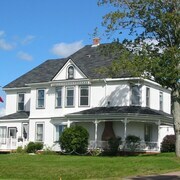 While visiting Bedford, be sure to check out the Scott Manor House and Dewolf Park. If enjoying sport is a favourite pastime, make sure you visit Halifax Metro Centre, which is 35 kilometres (23 miles) to the south of Elmsdale. If you are interested in booking a room close by, make a reservation in the Prince George Hotel or Cambridge Suites Hotel. Stanfield International Airport can be found 10 kilometres (6 miles) from Elmsdale. 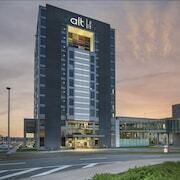 Travelers who wish to stay nearby, you can book a room at the ALT Hotel Halifax Airport or Quality Inn Halifax Airport. What are the most popular Elmsdale hotels? Are there hotels in other cities near Elmsdale? 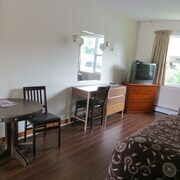 What other types of accommodations are available in Elmsdale? Explore Elmsdale with Expedia.ca’s Travel Guides to find the best flights, cars, holiday packages and more!